While we talk about the POS credit card processing, what's the first thing that strikes your mind being the restaurant owner? 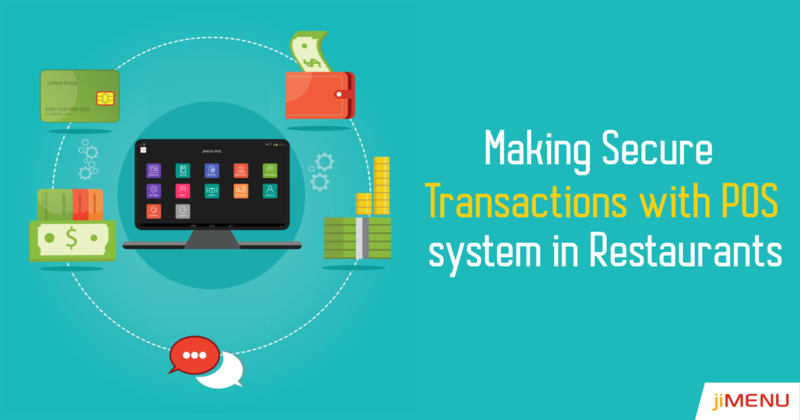 Most probably we all wish that the vendor we choose offers secure transactions. Isn't it? Exactly this is the point where emerges a need to go for a vendor which assures to safeguard the customer data and thereby assist you in maintaining a trust for your brand name. Making POS transactions more secure! Due to the various data breaches and other hacking attempts, restaurant owners and the business influencers have made a smart switch to digital menu POS systems which can easily streamline their daily restaurant tasks, and along with it provide secure transactions too. This will directly benefit the staff and get a huge customer base too. Thereby, getting optimized sales with happy customers. Seems interesting, isn't it? As the technology is evolving day by day, hackers are implementing new techniques to peep into your network and get the access. So, let's get a better view about which all points to look up in our POS vendor while making safe transactions and staying on the safer side! Is the POS system PCI compliant: Making your POS system arranged with EMV, E2E, and tokenization techniques is not enough to stay away from the risk zone. You must make sure that the system is PCI DSS (Payment Card Industry Data Security Standards)compliant. If you fail to fulfil PCI regulations, you might face heavy fines and a dropdown in your food business. So, make sure about the PCI compliance into your POS system and you might ask your vendor for proof about their PCI compliance. Updated technology: Keeping an eye over your POS system about the updates is a must. As the technology updates daily, so does the POS systems. Outdated systems act as an open invitation to the hackers. So, make sure your vendor carries out updates on a regular basis with appropriate antivirus and antimalware software. Moreover, make sure that the login credentials of your firewall and panel are updated after a period of time rather than keeping the default passwords. Isolate your POS systems: Try to make it clear with your vendor that the POS system must stay separate from the other networks in your system. Keeping the POS system isolated will keep your system away from the hackers and other hacking attempts. But unfortunately, most of the POS systems are connected to many systems. SO, try making your POS system isolated. Encryption services(E2E): The encryption technique keeps the whole data in an encrypted form i.e., in a format which is not readable by humans. It can only be decrypted if the user holds the decryption key in the form of credentials. So, ask your vendor if the POS system has encryption services into the system or not. If yes, do they charge you an extra fee for it? Keeping data encrypted will keep the data safe from the hackers and even in case the hacker fetches the data, he'll get the data in a format which he doesn't understand. While you step out in the market to find a vendor for your restaurant, you'll encounter a number of vendors who'll guarantee you secure solutions. But don't get fooled into the trap. Take your time, get through their customer reviews, their past experience, security solutions, and most important that do they offer free trials or not. Along the way, we have a perfect alternative for you which will assist you to overcome all the existing problems in the restaurant. jiMenu POS Is one such easy to opt platform via which you can streamline your restaurant daily tasks over a reliable, secure, and budget firendly platform. For more details and queries, get in touch with us and choose the suitable vendor foy you!